The forest fires that have been ravaging California this month became the deadliest in the state’s history. The number of missing doubled to 631, after authorities earlier put the number closer to 300 and the death toll also rose to 65 after the remains of seven more people were found. Out of the victims, some 53 have been identified. Several people who were listed as missing have been located, bring the total of people found alive to 227. 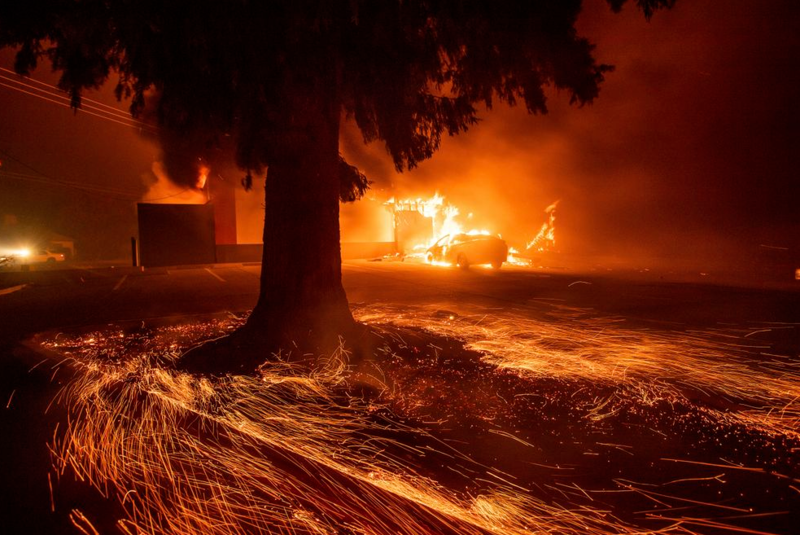 Butte County Sheriff Kory Honea explained that the shifting total numbers were because investigators had thoroughly cross-checked their information, including emergency calls made since the Camp Fire started on 8 November. "I want you to understand that the chaos we were dealing with was extraordinary," Sheriff Honea said. "If you look at that list and see your name, or the name of a friend or loved one, please call to let us know." According to the California Department of Forestry and Fire Protection (Cal Fire), the fires are currently 40 percent contained. Chief fire department official Ken Pimlott explained: "We continue to engage in the firefight. We continue to keep our eye on the ball." Officials say they do not expect to fully contain the blaze until the end of this month. As the death toll leaps, the fires have thus become the deadliest in California's history. Only ruins remain of the town of Paradise, which will need a rebuilding job estimated to take years. Hundreds of relief workers in white protective clothing are searching, with the help of dogs for possible bodies in the rubble. A forest fire also raged in southern California, near the resort of Malibu. There, two people died. In the meantime, fireman’s teams are still busy putting out the fire. Because of the cooler weather they are starting to make progress. ATTENTION: ITS HAPPENING THE INDECTMENTS ARE HAPPENING… GO TO … theyig.ning..com look under Indict Resig FOIA EO PDF's… PANIC IN DC THE BEGINNING OF THE END. ATTENTION: ITS HAPPENING THE INDICTMENTS ARE HAPPENING… GO TO … theyig.ning..com look under Indict Resig FOIA EO PDF's… PANIC IN DC THE BEGINNING OF THE END. The illuminati is on plan with their satanic baphomet plan. Kill them all. The 300 families! The Green ECO movement is to blame demanding NO Touch Undergrowth Forestry Rules, which allowed this to happen. I do not care. They hate real America, so f 'em. i feel sorry for all the wonderful animals that were burned alive. These fires were started by the deep state. Investigate what they are and have been doing with high powered lasers. It's all part of UN Agenda 21, to depopulate the coasts.